Windows Easy Transfer running on Windows 8. Windows Easy Transfer was a specialized file transfer program developed by Microsoft which allows users of the Windows operating system to transfer personal files and settings from a computer running an earlier version of Windows to a computer running a newer version. The Windows Easy Transfer program was discontinued in Windows 10. Microsoft has chosen to provide a free version of Laplink's PCmover Express as an alternative to WET. End users also have the ability to upgrade to PCmover Professional (a paid version) which allows the transfer of applications as well. For Windows 2000, Microsoft had developed the User State Migration Tool command line utility that allowed users of Windows 95, Windows 98, and Windows NT 4.0 to migrate their data and settings to the newer operating system; the command-line tool did not provide a graphical user interface. An additional migration tool, titled Files and Settings Transfer Wizard, was developed for Windows XP. FSTW was designed to assist users of the operating system in migrating their data and settings from Windows 98 and Windows Me. FSTW could be launched from the Windows XP CD-ROM and presented options to transfer data and settings via a direct cable connection, a 3.5 inch floppy, a zip disk, or a network connection. Moreover, an option to create a wizard disk was available that could be used to initiate the migration process on an earlier system. A preliminary version of Windows Easy Transfer was demonstrated during the Windows Hardware Engineering Conference by Jim Allchin in 2004 as the successor to the Files and Settings Transfer Wizard, and was scheduled for the next client version of the Windows operating system, Windows Vista, then known as Windows "Longhorn." As with the final release, this version of the application was intended to optionally use an specialized USB cable to transfer data between personal computers. Windows Easy Transfer does not support transferring installed applications. For transferring certain supported applications from Windows XP to Windows Vista, Microsoft had planned to release a supplementary Windows Easy Transfer Companion application, but the application remained as a perpetual beta during development and a final version was never released. The Easy Transfer Cable is a special USB 2.0 cable used to connect two computers together. The connectors are both USB-A male connectors to connect to each PC, and the cable has a small box in the middle which contains the electronics needed to allow the computers to communicate with each other, and controls data flow between the two computers. Various manufacturers produce suitable cables. Several vendors sell Easy Transfer Cables including Laplink Software. 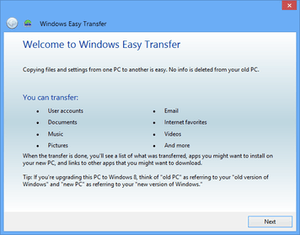 In Windows 8.1, Windows Easy Transfer can only import settings from Windows 7, Windows 8 and Windows RT, but not from another Windows 8.1 computer, or from Windows Vista. The only transfer method supported in Windows 8.1 is via a saved archive (USB drive method); transfers via an Easy Transfer Cable or network connection are not supported. 1 2 3 4 Microsoft (March 15, 2007). "Description of Windows Easy Transfer for Windows Vista". Microsoft Support. Retrieved April 23, 2015. 1 2 Microsoft (February 24, 2012). "How to use Windows Easy Transfer to migrate files and settings from one Windows-based computer to another Windows Vista-based computer". Microsoft Support. Retrieved April 23, 2015. ↑ [WMPoweruser] (September 1, 2015). "Microsoft makes file transfers to Windows 10 easier, currently offering PCmover Express for free". Retrieved September 2, 2015. 1 2 "Free data transfer". www.microsoft.com. Retrieved 2016-04-27. 1 2 Schmied, William (February 4, 2003). "The Files and Settings Transfer Wizard helps migrate user settings". TechRepublic. CBS Interactive. Retrieved April 23, 2015. ↑ Thurrott, Paul (October 6, 2010). "Using the Files and Settings Transfer Wizard". Supersite for Windows. Penton. Retrieved April 23, 2015. ↑ Thurrott, Paul (October 6, 2010). "WinHEC 2004 Show Report and Photo Gallery". Supersite for Windows. Penton. Retrieved April 23, 2015. ↑ Abrams, Lawrence (December 13, 2012). "Using Windows Easy Transfer to transfer your data to a new computer". Bleeping Computer. Retrieved April 25, 2015. ↑ "Windows Easy Transfer (Win 8.1) - Microsoft Community". answers.microsoft.com. Retrieved 6 July 2015. ↑ Whitney, Lance (2008). "Utility Spotlight Windows Easy Transfer Companion". Microsoft TechNet. Microsoft. Retrieved April 23, 2015. ↑ White, Nick (February 15, 2007). "Using Windows Easy Transfer". Windows Vista Team Blog. Microsoft. Archived from the original on February 16, 2013. Retrieved April 23, 2015. ↑ Bott, Ed (July 18, 2008). 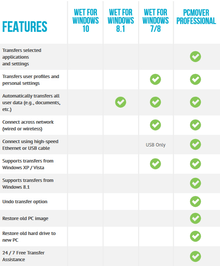 "Has Microsoft pulled the plug on Windows Easy Transfer Companion?". CNET. CBS Interactive. Retrieved April 23, 2015. 1 2 Bravura Software. "Easy Transfer Cable". Retrieved April 23, 2015. ↑ "Easy Transfer Cable for Windows". ↑ Microsoft. "Transferring files and settings: frequently asked questions". Retrieved April 24, 2015. ↑ Microsoft (March 15, 2007). "The option to use a serial cable connection or an infrared link is unavailable when you create an incoming connection in Windows Vista". Support. Retrieved April 24, 2015. ↑ Huc, Mauro (July 22, 2013). "Microsoft removing Windows Easy Transfer in Windows 8.1". Pureinfotech. Retrieved April 24, 2015. ↑ Collins, Barry (July 11, 2014). "Windows Easy Transfer - not so 'easy' in Windows 8.1". PC Pro. Dennis Publishing. Retrieved April 24, 2015.